Eating a bag of fresh popcorn is a great way to snack. But did you know that you can also use popcorn as an ingredient in recipes? 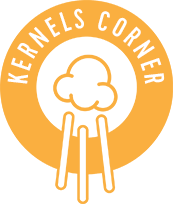 If you’re ready to push the boundaries of what those small but mighty kernels are capable of doing, step right up!We’re taking you out of the snack bag and into the kitchen with a couple of recipes using popcorn. March 17th has a way of bringing out the Irish in everyone. Whether you’re donning green from head to toe or sipping on a Shamrock Shake, there are so many ways to celebrate Saint Patrick. To help you channel you inner Irishman or Irishwoman, we’ve put together a list of the best films set on the Emerald Isle and a recipe to pass on a little bit of the luck of the Irish. February is Heart Month, a good time to soften your heart and open it up to others. Yes, that sounds corny but that's ok when you are in the corn business. And of course speaking of the heart, February contains a very special day - Valentine's Day! Every February 14, across the world, candy, flowers and gifts are exchanged between loved ones, all in the name of St. Valentine. But just who is this saint, and where did these traditions come from? On this edition of PopTalk, we’re all about the love, and discussing everything to do with Valentine’s Day!